Veatch Ophthalmic Instruments offers cutting edge technology for all ophthalmic procedures, including corneal topography. Corneal topography is a diagnostic tool that maps the curvature of the cornea and the outer structure of the eye. Topography imaging is an important part of determining your corneal health and the quality of your vision and can assist in the planning of certain ophthalmic surgeries. The process includes altimetric maps with spherical, aspherical, and aspherotoric reference surfaces. The low illumination level of the keratoscopic rings makes the exam more comfortable for the patient while also ensuring a large pupil size. Our instruments allow for accurate, reliable imaging and diagnosis, ensuring quality care for all your patients. 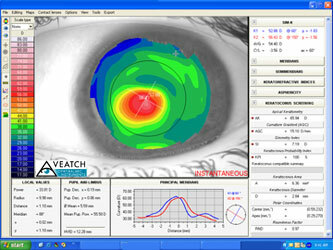 ReSeeVit's Modi WaveFront corneal topographer offers the most advanced features available in the market. ReSeeVit Corneal Topography is an advanced corneal topography system that features corneal wavefront aberrometry with advanced Zernike analysis, kerato-refractive indices, keratoconus screening, and visual quality summary with high and low contrast optotypes convolution. This machine also features powerful contact lens fitting software, preferred lens analysis and management. Integrated Infrared Pupillographer (optional) for dynamic pupil analysis with binocular stimulus allows for viewing pupil changes on the topography map. Placido’s disk, a wide, cone-shaped structure of black and white rings, makes it possible to work at a comfortable distance of 56 mm, which creates consistent and repeatable results. 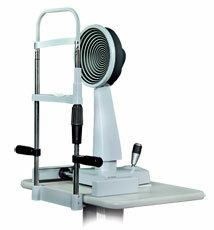 If you have any questions about our corneal topography machines, please don’t hesitate to contact us.